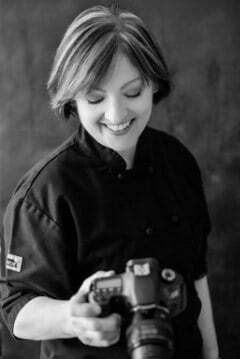 What do you say we shake up two classic dishes and combine them? 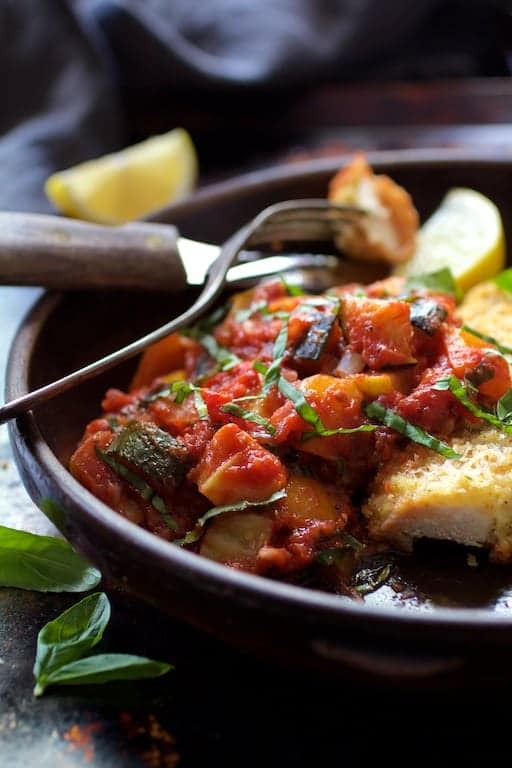 Chicken Scallopini with Roasted Vegetable Ratatouille is a healthier, fresher twist on Italian Chicken Parmigiana combined with the goodness of French Ratatouille! As I was writing this, a beautiful thing happened. The last time it rained was when I was photographing my Spice Rubbed Pork Tenderloin with Peach Chipotle Barbecue Sauce. That was well over a month ago! Perhaps growing up on a farm where acres and acres are dependent upon rain for a farmer’s very survival and then living in Memphis makes me never complain about rain. Here in Memphis, when the rain stops in the summer–it stops and very dry conditions ensue! When zucchini and yellow squash become abundant in our garden it’s also a beautiful thing. 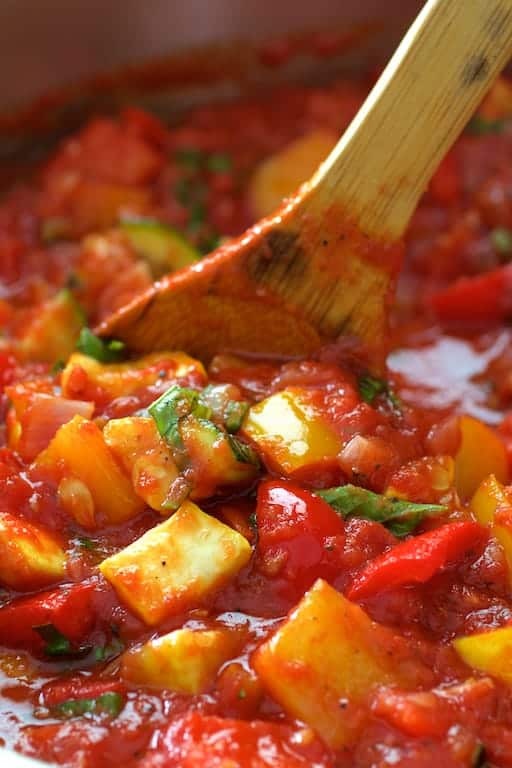 When that happens, I crave one of my favorite dishes–lovely Provencal-inspired Ratatouille! Ratatouille has endless variations. Some recipes call for the vegetables to be combined and cooked together for a long period of time until they become very soft. Other recipes call for the vegetables to be sautéed or browned in stages then combined and stewed in the oven or on the stovetop. 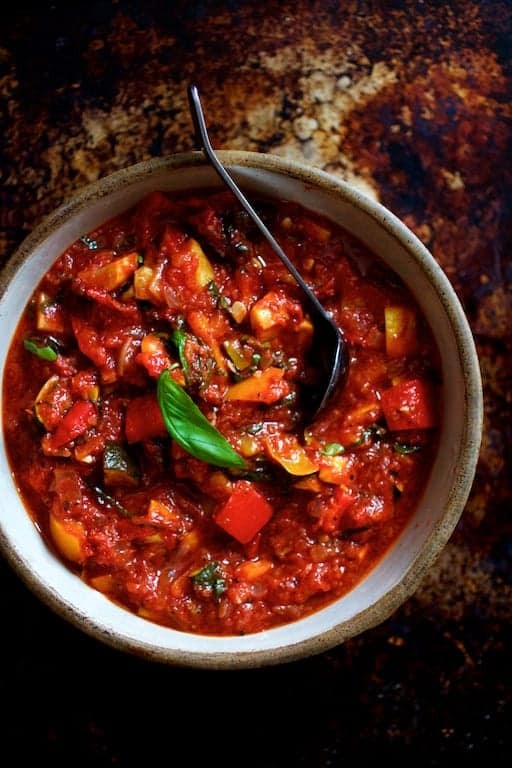 Roasting the vegetables in the oven first then adding them afterward to a simmering tomato-based sauce is my favorite way to make ratatouille. 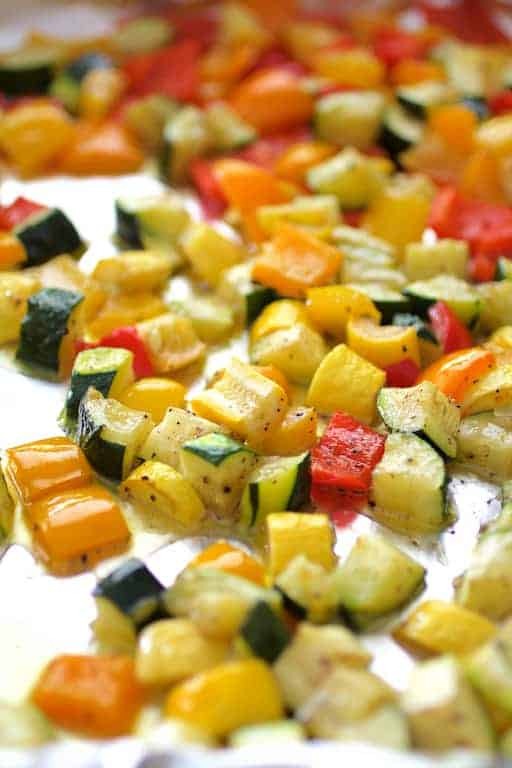 The vegetables retain their texture better when roasted. Do I need to say a whole lot more? 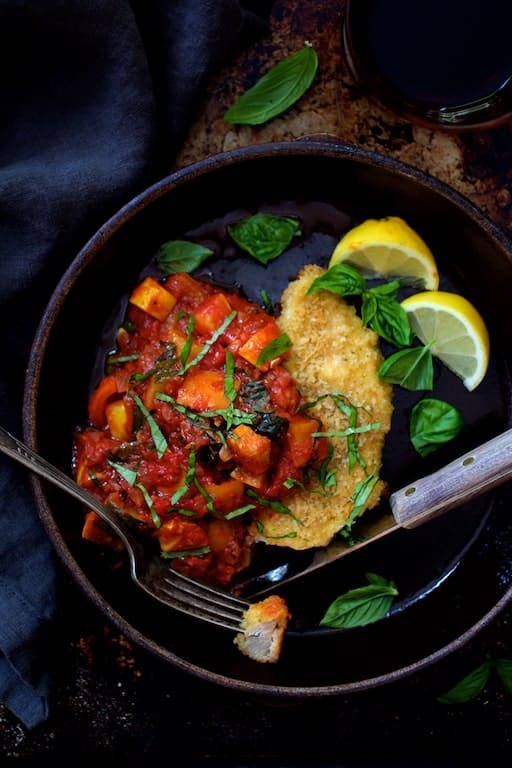 …Except for combining this beautiful Mediterranean-inspired medley of vegetable perfection with crusty baked chicken scallopini? I never fry chicken for Chicken Parmigiana for clients. I like to bake it because I personally don’t like the oil-soaked coating. 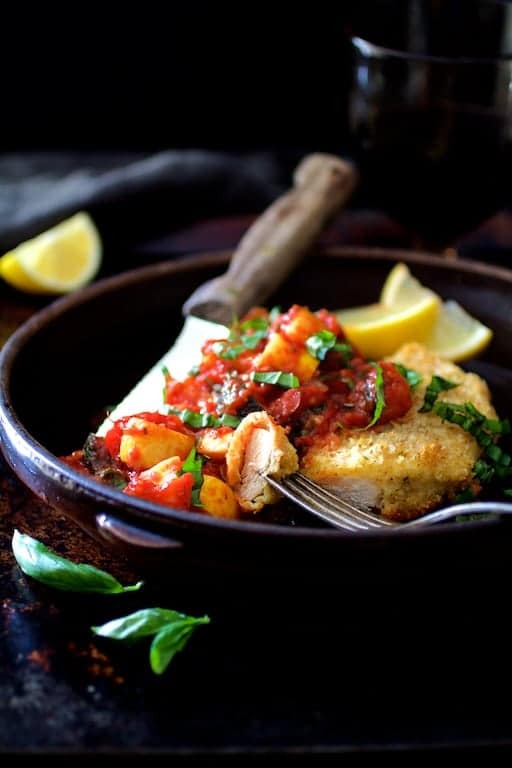 The light, crusty Chicken Scallopini with Roasted Vegetable Ratatouille was love at first bite! With fresh basil sprinkled over it and a squeeze of lemon, we had a beautiful, simple, rustic chicken dish we’ll be making many more times! RATATOUILLE: Preheat oven to 400 degrees. 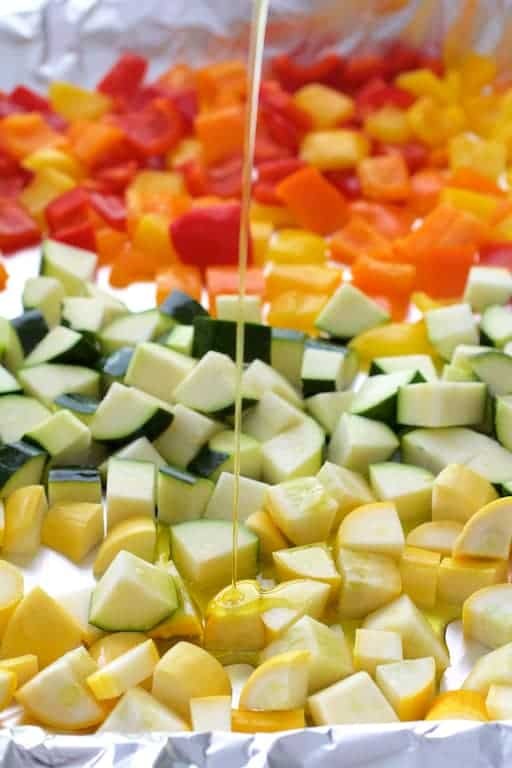 Arrange vegetables on a non-stick baking sheet (or line with non-stick aluminum foil), drizzle with 3 tablespoons olive oil and season to taste with salt and black pepper. Roast for 15-20 minutes or until softened and lightly browned. Meanwhile, place remaining 2 tablespoons olive oil in a deep skillet and heat over medium-high heat. Add the onion, reduce heat to medium-low and cook 6-7 minutes or until beginning to soften. Add the garlic and tomato and cook 3-4 more minutes or until the tomato is very soft. Add the white wine. Bring to a boil, then reduce heat and add the crushed tomatoes and herbes de Provence. Simmer uncovered 5-10 minutes. Add roasted vegetables and fresh basil and keep warm. CHICKEN: Reduce oven temperature to 375 degrees. Prepare a nonstick baking sheet by spraying with cooking spray or lining with nonstick foil and spraying with cooking spray. Combine flour, salt and black pepper in a large zipper-top bag. Place eggs in a bowl. Combine breadcrumbs, panko and Parmesan cheese in another bowl. Place chicken cutlets in the zipper top bag and coat well with the flour. One by one, dip in the egg, then the breadcrumbs and place on the prepared baking sheet. Spray with cooking spray. Bake 15-18 minutes or until lightly golden and a thermometer inserted registers 165 degrees. 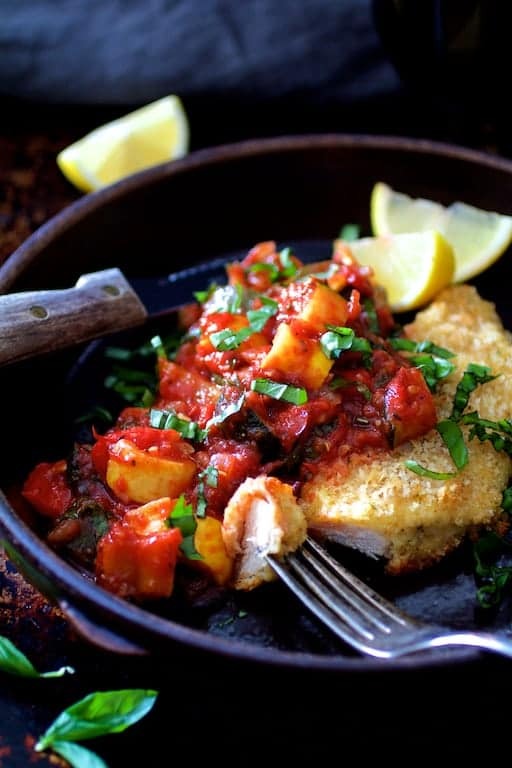 Serve ratatouille with chicken. Garnish with fresh basil and serve with lemon wedges. This is my kind of chicken dinner! Love all the flavors in this. I need to hunt down some garden zucchini because this is going on my ‘To Make’ list! This is like 2 great dishes in one! What a gorgeous topping for the scallopini!